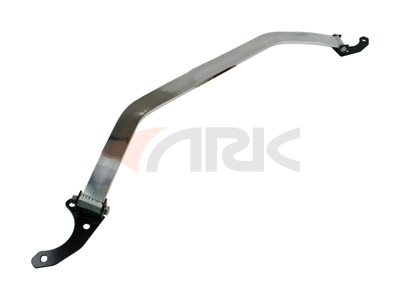 The ARK style front strut bar is a common upgrade item that all Hyundai owners acquire is a strut bar (also known as strut tower bar or strut brace). A strut bar mounts between opposing strut towers and reduces the flex that these towers experience during hard cornering. Reducing the flex will keep the wheels in position. Keeping the wheels in position helps keep the tires in the desired position on the road. This will help to improve traction on the turns, increasing turn-in response. A front strut bar should help to reduce under steer and a bar in the rear should help to reduce over steer. (Please note actual product may vary slightly from pictures).